High quality sound reinforcement system with active 12" subwoofer and 6 x 3" satellite column speaker, powered by a high efficiency class-D bi-amplifier. Cabinets are made from 15mm MDF and coated in a hard-wearing textured coating with integral carrying handle for the sub cabinet. 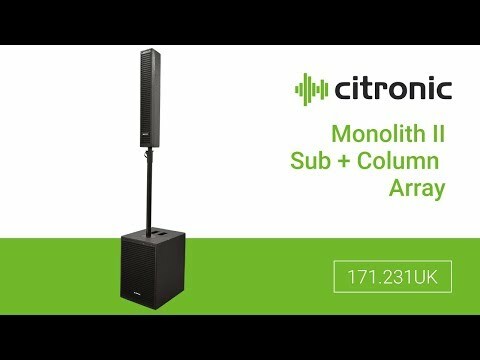 The column links to the sub via a Speakon® connector and mounts on top with the supplied telescopic pole. Clean and understated looks provide a minimal profile whilst delivering powerful and high quality sound projection for performers, DJs and conference. Replacement passive crossover filters for CV series passive speakers.